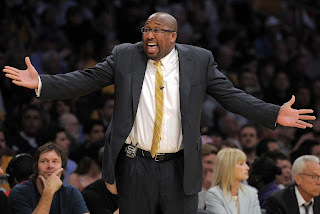 Why the Lakers firing Mike Brown is a mistake and who will replace him? With the exception of the breaking news out of Langley, the big story today is that the Los Angeles Lakers have pulled the plug on head coach Mike Brown after only 71 games with Showtime. The heat was on Brown as the much-ballyhooed team, after acquiring Steve Nash and Dwight Howard over the summer, stumbled to a 1-4 start this season. A lot of folks have been calling for Brown's head, but I am not one of them, as I believe that Brown should not have been fired. But who will replace him long-term? I am not a fan of the timing of this firing, considering the fact that the Lakers are playing a game tonight against the Warriors, as you don't often see coaches on days like that. And I also think this firing is too early. Yes, I understand the Lakers have been a mess this season but the Heat did not light the world on fire initially with the "Big Three," as they started only 9-8 and they had their fair share of rumors of Erik Spoelstra not getting along with LeBron James (remember the bump?) and it seemed like he was bound to be fired too. The Heat didn't make a rash decision and ended up in the Finals and won it last year. Yes Brown had issues with Kobe Bryant and there were rumors he had lost the team but it's been only five games, give it some time. Nobody expected the team to make beautiful music initially and Nash has been hurt of late as well. Also, the criticism over Brown and implementing the Princeton offense has been a little unfair. After all, it was not Brown's idea initially to bring in the Princeton, but actually it was Bryant's idea as a way to get him more space on the court. Bringing in Steve Nash was thought to only make the Princeton more potent because of how well he could move the ball. And adding Dwight Howard made the opportunities in the offense even more tantalizing. Maybe it wasn't a great idea to not do some run-and-gun with Nash but he also had barely any time in the offense before getting hurt. And did Bryant influence management's decision to dump Brown? I think so, or he at least played a role in the firing. There has been no question that Bryant was not a fan of Brown, he was not the guy that Bryant wanted (that was Brian Shaw, who at the time was an assistant in Los Angeles) and considering how much Bryant is worth to the team and how much he is bring paid, the front office would decide to placate him and make this move. Again, I think it's too soon for Brown to get the axe and I think he's a very good coach, and that only make me ponder more about Bryant's involvement, because the organization is not known for making rash decisions like this. Not, who will replace Brown? Well, to be literal, the answer is Bernie Bickerstaff, who will take over the team in the short-term, but the team has said they are actively searching for a long-term coach right now. Of course, the candidate at the top of the list is Phil Jackson and considering the rumors that he may have been interested in the Knicks job, there could be something there. However, I doubt it, I think he's truly done coaching, I think he's done dealing with Bryant and besides, he is the best coach ever but if people are angry with playing Nash in the Princeton, you really want to shackle him in the Triangle? Another candidate that could make a lot of sense is Mike D'Antoni, who of course led Nash during the best years of his career, is known as an offensive wizard and a great players' coach, and all those concerns about how his teams don't play defense is not as huge of a deal when you have a game changer on the defensive end like Howard. Personally, I'm intrigued by the Lakers looking at Jerry Sloan. He's one of the top coaches ever and how awesome would Nash and Howard be in that pick-and-roll? Or even Nash and Gasol in the pick-and-pop?